American research teams returned this week to ice station Barneo, a Russian logistics hub floating on sea-ice covering the Arctic Ocean near the North Pole. There, they continue some baseline measurements of oceanic and atmospheric conditions collected since 2000. With National Science Foundation funding, the University of Washington’s Jamie Morison leads the North Pole Environmental Observatory (NPEO) effort, an international collaboration. “Six personnel flew to Barneo on 10 April over the course of two flights,” wrote Tom Quinn (Polar Field Services), who is now positioned at Longyearbyen, on Norway’s Svalbard Archipelago, through April. Tom in Longyearbyen and Andy Heiberg at Barneo are coordinating NPEO logistics from both locations. The armchair North Pole scientists among us will recall that the true course of work at ice camp Barneo is always a challenge, and so far, this year is no exception. Members of the team will recover an instrumented mooring that has been fixed to the ocean floor some 2.5 below the surface since 2008. 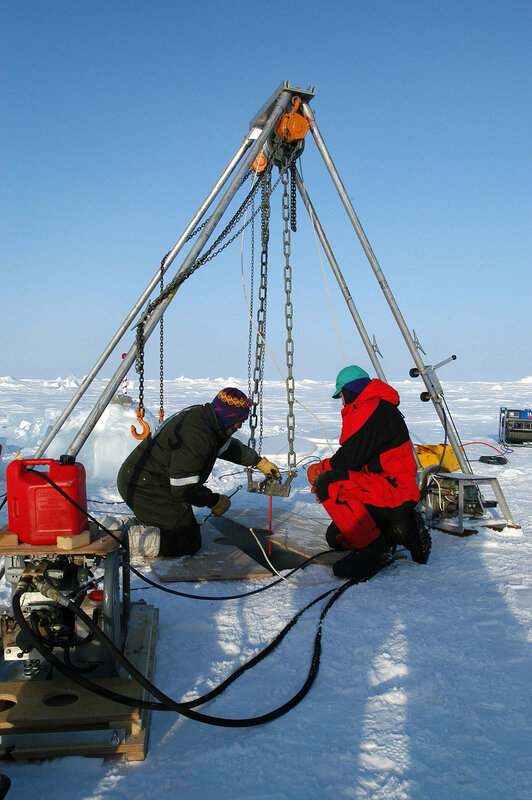 The mooring holds instruments that capture baseline measurements—ocean temperature and salinity, current strength and direction, and sea-ice conditions, for example. Other NPEO researchers will fly hydrographic surveys in a Twin Otter, deploying instruments that will collect similar information as they sink slowly through the water column. In addition, a MI-8 helicopter will land near individual instruments previously deployed; researchers will send a radio signal and the instruments will release their data payload, sending atmospheric, weather, sea-ice and upper ocean water column information to the team on the sea ice.